It is day two of National Vegetarian Week, and today I am continuing the "surprisingly simple" theme by featuring a Vegetarian Hungarian Casserole made using Vegetarian Sausages. A surprisingly simple way to eat Vegetarian is to supplement meat products for soya or mycoprotein based products. 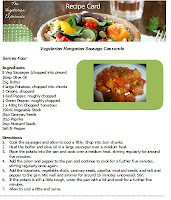 Rather than using meaty sausages in this recipe, I have used vegetarian sausages. Try to use quite robust sausages rather than vegetable filled soft versions as they may break up quite easily. This dish is basically your (veggie) meat, potato and veg in one bowl. I love the fusion of the flavours as the spices mix with the ingredients It would taste even more fantastic if cooked in the slow cooker so that the flavours have even longer to mix. Cooking on the hob only took around thirty minutes, and preparation around fifteen minutes so it is a really great dish to cook if you have a little time to spare in the evening. Why not try this dish out and tell me what you think. Heat the butter and olive oil in a large saucepan over a medium heat. Place the potato into the pan and cook over a medium heat, stirring regularly for around five minutes. Add the onion and pepper to the pan and continue to cook for a further five minutes, stirring regularly once again. Add the tomatoes, vegetable stock, caraway seeds, paprika, mustard seeds, and salt and pepper to the pan. Mix well and simmer for around 15 minutes uncovered. Stir. If the potato is still a little tough, cover the pan with a lid and cook for a further five minutes. Allow to cool a little and serve.